Click the PDF below to fill out a brief "Welcome form" to speed up the check-in process at your first appointment! 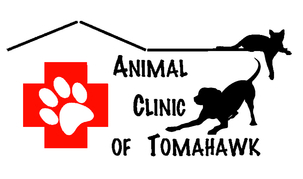 Located in downtown Tomahawk, Wisconsin, our veterinary clinic strives to provide the best veterinary care at the most affordable prices to ensure all of your four-legged family members are healthy, happy, and well! Throughout this website, you can find information including brief histories about our doctor and staff, contact information, directions, as well as an abbreviated list of our products and services. Click on the thumbnails below for descriptions!